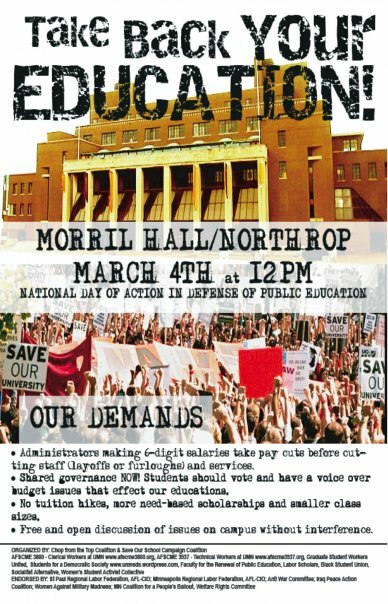 March 4th Rally and Protest – CHOP from the TOP! At the University of Minnesota over 250 administrators earn more than $200,000 in salaries while the Administration pushes its budget problems onto the backs of staff and students. Skyrocketing tuition and staff layoffs abound – and now we hear about possible furloughs. 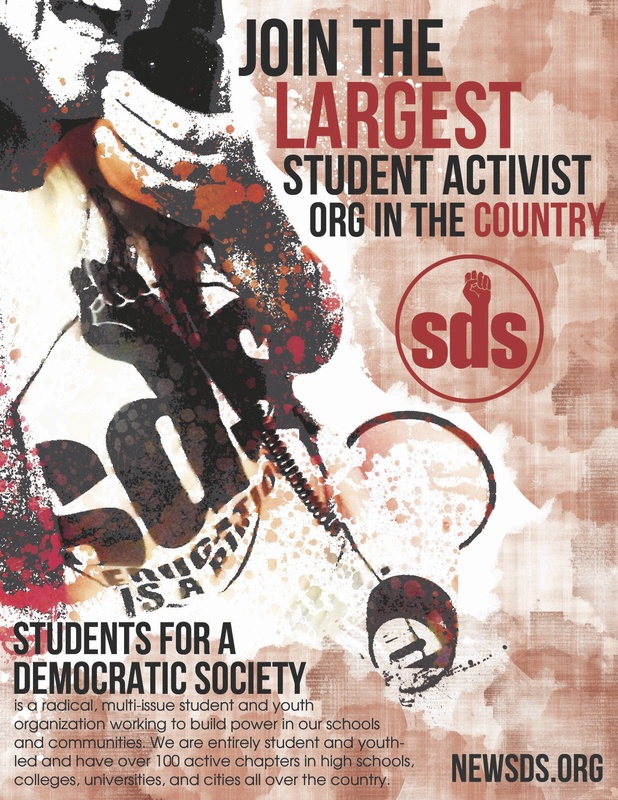 NATIONAL DAY OF ACTION! 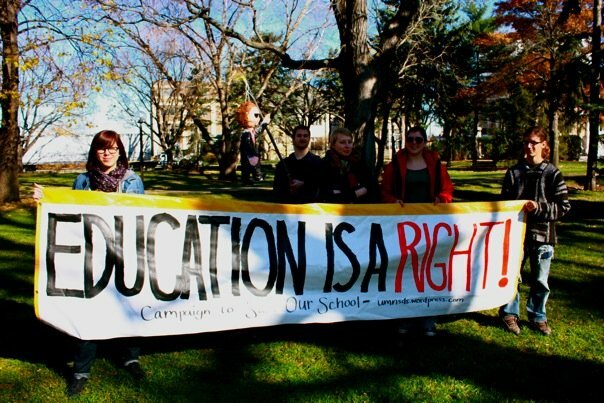 Join students, staff & faculty around the US to demand that higher education be funded – it’s a right and not a privilege! It’s time for those who can afford it to take the cuts! Over $272 million in private donations made up 6 percent of the University’s budget in 2009. The University of Minnesota ranked 16th nationally in the amount of private donations made to colleges and universities during the 2009 fiscal year, according to a report released Wednesday by the Council for Aid to Education. The University reported a total of more than $272 million in donations for fiscal year 2009, which was an 11.5 percent drop from 2008. Private donations made up about 6 percent of the University’s budget in 2009. Private donations dropped almost 12 percent nationwide, the largest decline since the study started in 1957, Ann Kaplan, survey director, said. The steep drop was undoubtedly due to the economy, she said. The University came in sixth among public university donations, just above the University of North Carolina at Chapel Hill and below the University of California, San Francisco. The University of Wisconsin was the only school in the Big Ten with more private donations. Before fiscal year 2008, colleges and universities were seeing an average increase in donations of about 4 percent a year, Kaplan said. In 2008, the University saw the highest amount of donations in a decade, reaching $289 million. That amount had been increasing each year since 2004, according to the University’s 2009 Report on Giving. According to the University’s report, there was a nearly 8 percent drop in the amount of donations between 2008 and 2009, and the number of donors decreased from 87,989 in 2008 to 83,156 in 2009. The University and the Council for Aid to Education record donations differently, said Martha Douglas, director of communications for the University of Minnesota Foundation, which manages donations. When the University generates its report, Douglas said, it includes information such as the known amounts of future pledges, which CAE does not use. However, CAE does include gifts to other parts of the University besides the University of Minnesota Foundation, which are not included in the University’s Report on Giving. Among the top 20 institutions reporting the highest amount of donations, there were nine public schools. Only two other Big Ten schools were among the top 20 institutions, with the University of Wisconsin coming in 10th and the University of Michigan at 18th. While the drop in private donations was the largest the council has ever seen, Kaplan said she thinks institutions will recover at least some of that money in the next few years. The Daily looked at who is making the most money and how total earnings break down by department. At an institution as large as the University of Minnesota, more than $1 billion is handed out in paychecks every year. With a grim financial forecast, those dollars have come under the scrutiny of the University as it desperately looks for ways to cut costs. The Minnesota Daily looked at University employee salary data for fiscal year 2009 to find out who made the most money and how the paychecks of top administrators and faculty compared across departments. Almost all of the top administrators and faculty at the University made more than the average employee in the same position in colleges across the country. Most academic deans at the University took home upwards of $100,000 in total earnings last year with little disparity between them and the average salary of faculty members serving within their respective departments. Faculty and deans in the Carlson School of Management received, on average, the highest total earnings among the University’s undergraduate, graduate and professional colleges. Methodology: The Minnesota Daily ranked the 10 highest paid employees at the University by their contracted salary, but also included each employee’s actual total earnings, which included regular and overtime earnings. Each University employee’s salary is compared to the average salary for employees in the same position in colleges across the nation. The average institutional salary for head coaches was calculated by taking the average men’s and women’s 2009 coaching salaries — provided by the NCAA — of more than 25 Division I-A schools with similar sized undergraduate classes as the University. Other University employee salaries are compared to the median institutional salaries for employees in the same position, according to the Chronicle of Higher Education. Some employee’s actual total earnings were lower than their contracted salary for fiscal year 2009. The reason for this could be if an employee worked only part of the year, took leave or were on partial appointment, according to University News Service. Background: Smith became the 16th head coach of the Gophers Men’s Basketball program in 2007. Prior to his time in Minnesota, Smith claimed a national title with the University of Kentucky and helped coach the gold-medal winning 2000 U.S. Olympic basketball team in Sydney. Smith is on the NCAA Committee to study basketball issues. Background: Davis-Blake became the 11th dean of the Carlson School of Management in 2006. She spent most of her academic career at the University of Texas-Austin’s McCombs School of Business, where she was senior associate dean for academic affairs. Davis-Blake received her bachelor’s and master’s degrees from Brigham Young University, and her doctorate from Stanford University’s Graduate School of Business. Background: Bruininks became the 15th president of the University in 2002. Before taking the University’s top spot, Bruininks served the University as a professor, dean and executive vice president and provost for about 40 years. In 2007, Bruininks joined the NCAA Division I Board of Directors and was named Executive of the Year by the Minneapolis St. Paul Business Journal in 2009. He was also voted Minnesotan of the Year by Minnesota Monthly in 2004. He earned his Bachelor of Arts from Western Michigan University, and a doctorate in philosophy from Vanderbilt University’s Peabody College. Background: Cerra came to the University in 1981 as director of surgical critical care. In 2009, Cerra was appointed dean of the Medical School in addition to his role as senior vice president for health sciences. Cerra leads the University’s Academic Health Center, which encompasses the schools of dentistry, medicine, nursing, pharmacy, public health and veterinary medicine. Cerra received his bachelor’s degree in biology from the State University of New York at Binghamton, and his master’s degree from Northwestern University. Background: Brewster was named Minnesota’s 26th head football coach in 2007 after spending the previous five seasons as an assistant coach in the National Football League, including the 2005 and 2006 seasons as the tight ends coach for the Denver Broncos. Background: Wippman became dean of the University Law School in 2008 after spending time as a professor and associate dean at Cornell Law School. Wippman received his bachelor’s degree from Princeton University and h is master’s degree from Yale University. Background: Goldstein became president and CEO of the University of Minnesota Foundation in 2008 after spending almost a decade as a trustee at the foundation and vice president of strategic initiatives. Goldstein graduated from the University with a bachelor’s degree in history. Goldstein became chairman of Internet Broadcasting in 1997, a national network of television Web sites which partners with Hearst Corporation, the Washington Post, Newsweek and CNN. Background: Kehoe teaches economics at the University, with a focus on international trade and finance. Kehoe holds a Paul Frenzel Land Grant Chair in Economics and is currently the monetary adviser for the Federal Reserve Bank of Minneapolis. Kehoe received his doctorate from Harvard University and his bachelor’s in mathematics and Russian from Providence College. Background: Sullivan was named senior vice president for Academic Affairs and provost of the University in 2004. Previously, Sullivan was the dean of the University Law School from 1995 to 2002. Sullivan served for six years as the dean of the University of Arizona law school, and as associate dean at Washington University in St. Louis. Sullivan graduated from Indiana University. Background: Maturi was named the University’s athletics director in 2002. Prior to his arrival, Maturi was athletics director at Miami University in Ohio and the University of Denver. Maturi received a bachelor’s degree in government from the University of Notre Dame and a master’s degree from the University of Wisconsin-Platteville. Methodology: Using University of Minnesota salary data acquired by the Minnesota Daily, the following compares actual total earnings of top administrators and faculty members in 2009, including the president, vice presidents, vice provosts and deans. Both part-time and full-time professors were counted as faculty, but those who were paid hourly or in lump sums, rather than a set salary, were not included. Positions filled by a single individual, such as the president, senior vice presidents and deans, are recorded as the whole. The average total earnings were calculated for the positions whose general titles were held by multiple individuals, such as associate vice presidents, associate deans and professors. Those figures were rounded to the nearest dollar. Chancellors of the four University coordinate campuses, on average, receive $221,448 per year.